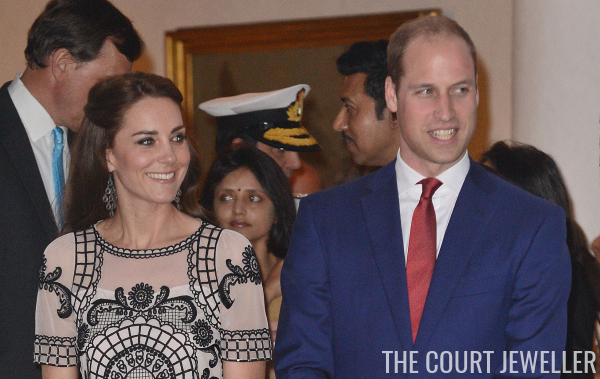 This evening, William and Kate attended a garden party at the residence of the British High Commissioner in New Delhi. The event was a 90th birthday party for the Queen, who celebrates her big day next week. Kate wore a new set of Alice Temperley separates with a pair of familiar silver-toned earrings. Here's a close-up of the design. Kate and her sister, Pippa, have both worn this pair; Kate's had them since at least 2007. Her biggest royal outing in the earrings before this garden party was at the Queen's annual Buckingham Palace Christmas luncheon in 2014. I like seeing a statement earring, but I would have loved to see another new pair -- and I think this outfit is absolutely screaming for a bangle bracelet or two.